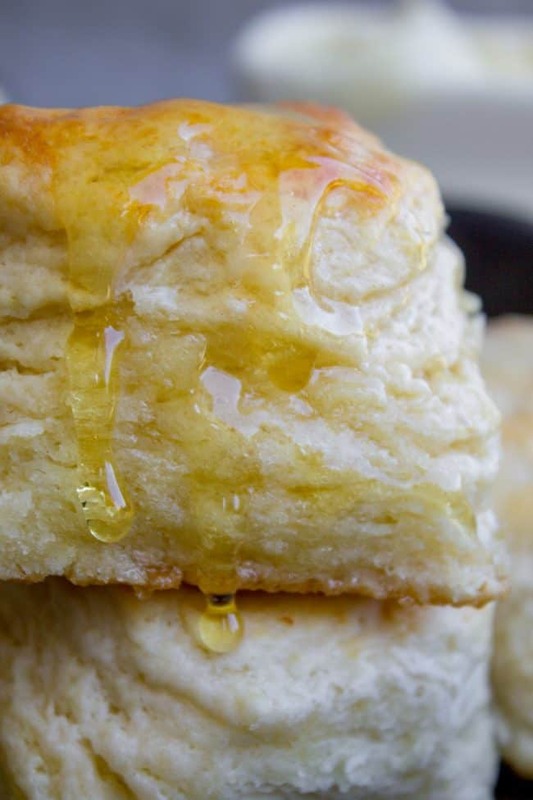 Who can resist a crispy-on-the-outside, tender-in-the-middle, mile-high flaky buttermilk biscuit? It's the perfect comfort food! Here's how to make them. It's not hard, just a few simple tricks! In a large bowl combine flour, salt, sugar, and baking powder. Cut the butter into chunks. Or, use a cheese grater to grate the butter. It's kind of fun! Use a pastry cutter to cut the butter into the flour. You can also use a fork, a butter knife, or your hands to work the butter into the dough. It should be crumbly with pea-size chunks. Stick the bowl in the fridge if you have any delays. In a small bowl combine the egg and buttermilk. Beat with a fork. Add ice and water to a small bowl, and set a tablespoon nearby so it's ready to go. Add the buttermilk mixture to the flour mixture. Use a fork to hydrate the flour. Do NOT over work the dough. Add ice water 1 tablespoon at a time. You don't need much, this is just to help the flour absorb into the wet ingredients. Make as few strokes as possible to get your result: a very thick, slightly sticky dough. Switch to using flour-dusted hands for the last few kneads. Turn the dough out onto a lightly floured work surface (a pastry cloth works great, if you have one.) Use your hands to pat the dough into a rectangle, then use a rolling pin to roll the dough into a roughly 12x8 inch rectangle. It doesn't have to be perfect. Fold the short sides of the dough into the middle, like a business letter. See photos. Turn the dough over (flouring your surface again if necessary) so that the seam of your business letter is down. Use your hands or the rolling pin to flatten the dough. This is the last step before cutting. Don't roll it too thin! You want THICK biscuits. Think like at least an inch if not more. Flatten the dough enough to where you will be able to cut at least 6-8 biscuits on the first go. Use a 3-inch biscuit cutter (<these are the ones I wish I had!) to cut the dough. Do NOT twist the cutter. Firmly push it straight down, then pull up. Use your fingers to gently loosen the dough from the cutter. Continue with the rest of the dough until there are only scraps. Gather the scraps in your hands, gently press them together, then roll out again, remembering to keep the dough thick. Continue until the dough is gone. Prepare a 12-inch cast iron skillet* with 1 tablespoon softened butter (or melted.) Make sure to grease the sides. Place the biscuits in the pan. They should be touching each other, as this helps them rise in the oven. Just before you put it in the oven, brush the top of each biscuit with buttermilk. This helps it to get that pretty brown topping. Bake at 425 for 15-20 minutes, or until the tops are golden. If the tops are brown but you suspect they are not done, lift the edge of one biscuit to check the bottom. They are done when the bottoms are brown. **While researching biscuits, I read that some restaurants make their biscuit dough a day in advance and freeze them, shaped. They put them in the oven frozen solid. I haven't tried it yet, but I bake cookie dough from frozen all the time so I'm pretty confident. You may have to bake longer. This would be a great make ahead option!